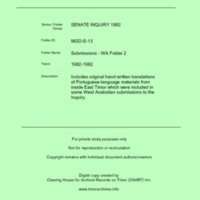 Includes original hand-written translations of Portuguese-language materials from inside East Timor which were included in some West Australian submissions to the Inquiry. For private research access only; not to be recirculated or published. Copyright remains with original author/creator of each document. “Submissions - WA Folder 2 [MGD E13],” CHART DIGITAL, accessed April 18, 2019, http://chart-digital.info/items/show/664.